Students with a basic understanding of the environment and concern for its future know the importance of preserving biological diversity. Biodiversity is the variety of living things on Earth or in a specific area. This definition seems simple enough to understand, yet the concept of biodiversity has deeper meanings that challenge even trained environmental scientists. A region that has a wide variety of species in robust populations is said to possess biodiversity. But not every place on Earth bursts with diverse life. Biodiversity concentrates in certain areas, while other parts of the globe possess a somewhat lesser variety and number of species. 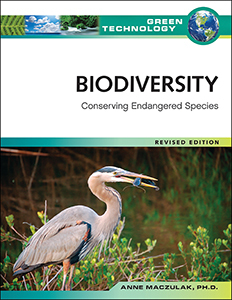 Biodiversity, Revised Edition takes a look at how habitats are destroyed, the devastating effect this has on biodiversity, and the ways in which scientists restore ecosystems and habits. This updated, full-color book also examines the ethical questions that arise when trying to rescue threatened species in the face of dire human conditions. Anne Maczulak, Ph.D., has more than 25 years of experience as a microbiologist and quality assurance specialist. She completed her undergraduate and master's studies at the Ohio State University and her doctorate from the University of Kentucky. She has authored peer-reviewed articles and technical reports and has served on corporate microbiology committees. Maczulak has given presentations on microbes in the environment and environmental health as well as workshops on quality control.